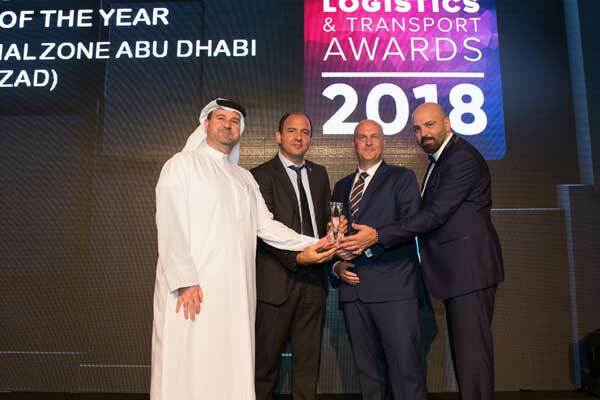 Khalifa Industrial Zone Abu Dhabi (Kizad) said it was named ‘Trade Facilitator/Free Zone of the Year’ at the inaugural Logistics & Transport Awards held on October 16, in Dubai, UAE. Competing against a wide range of shortlisted free zones and trade facilitators, Kizad was recognised for its ongoing success and vision for the future, said a statement. The awards scheme, run by Logistics News ME, is open to individuals and companies from a variety of sectors, including transportation, cargo, e-commerce, supply chain, and technology. The aim is not only to celebrate success but also recognise the future strategies of logistics and supply chain companies from across the region. At the awards ceremony, Obada Abu Shakra, vice president of Industrial Zone Business Support at Kizad; and Edwin Lammers, vice president of commercial at Kizad, accepted the award on behalf of the company. “This latest recognition is another chapter in Kizad’s success story, demonstrating its continued ability to foster a world-class and thriving industrial, manufacturing and logistics ecosystem that plays a critical role in attracting foreign direct investment to the emirate,” Al Shamisi said. “The customer experience is vital to the success of our business and we will continue to develop both new and existing products and services to ensure that firms based at Kizad can thrive and grow,” he added. The awards highlight the ongoing success and growth of Kizad, which last year saw total tenant occupied space increase by 27 per cent, while the total number of people working within the hub leapt by 15 per cent. Earlier this year, the industrial zone also signed agreements with 15 Chinese companies to invest $1 billion in the Khalifa Port Free Trade Zone (KPFTZ) and established an in-house China desk that can communicate effectively with China-based investors. The launch of of Kizad Logistics City and Kizad Construction City is also set to provide investors across key markets with products and services that offer greater efficiencies, connectivity and robust competitive positioning.